My story is a long one, as is many peoples. A mum to 4 beautiful yet sometimes crazy children aged 7, 12, 14 and 16, 1 fur baby and a big child I call my ‘Husband’! I love to cook and create delicious healthy meals & new recipes for the family and am passionate about helping families create happy, healthy and flourishing lives for themselves. I am no stranger to the battles and triumphs parents feel on a daily basis. We also live with the rewards and challenges that Autism, ADHD, Dyslexia, Sensory Overload and Anxiety bring, on a daily basis. 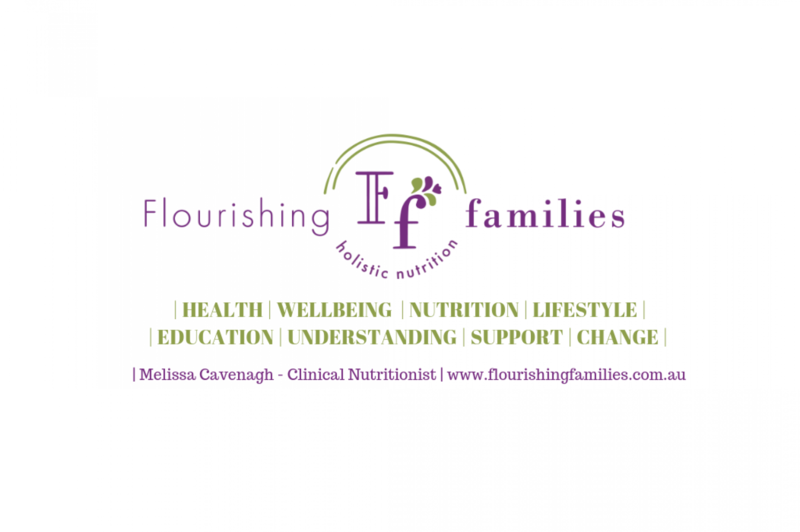 FLOURISHING FAMILIES is a combination of my study, evidence based research and personal experiences as a mum, sister, daughter, friend and wife. I know how busy life can be, how stressful our days can feel and the guilt that can seep in to every decision we make. You can read more about my story below and why I do what I do and why I am so passionate about helping families flourish. Our 16 year old has always been impulsive, inattentive & full of energy (he fidgets non-stop! ), but I was very reluctant to name this as ADHD, as my experience and exposure to ADHD was always the hyperactive & aggressive children, I had seen on TV. He was not aggressive and in fact extremely loving – he just couldn’t concentrate! I have since found out that only 20% of kids are like those on the TV and most are like our son, extremely distractable, impulsive and inattentive. At age 10 he was diagnosed with dyslexia (along with his sister then aged 6) and we thought this was the reason for his ‘class clown’ behaviour and his constant getting into trouble in class (I spent quite a bit of time at school talking to his teachers!). In year 7 after an incident saw him in trouble yet again, I took steps to have him assessed and ‘brain-mapped’ – I needed visible proof, before I wanted to go down the medication route (this however, is not an option for all parents and that’s ok!). So aged 13 he was placed on medication – his school principle herself rang me two weeks later, asking for his specialists name as she had other students who may benefit. She had never seen a child make such a turn around in just 2 weeks! So then the guilt set in – why didn’t we do this sooner, I’m a bad mum, it’s my fault, etc etc etc – sound familiar yet? But I can’t know what I don’t know and neither can you. But what I do know is medication is not long term and in fact can itself have affects on the neurochemical pathways in the brain. But sometimes we need to work with medications to provide the best treatment for our children and sometimes medication isn’t the right treatment and we just work with that too! Medication also brings appetite issues, mood issues & other side effects, which can all benefit from the support of holistic nutrition. Holistic nutrition looks at the complex interplay of the individual child’s diet, lifestyle, environment, genetic make-up and other influences, to know exactly whats happening with your child and develop a treatment plan to suit their unique needs. It may involve pathology, functional or genetic testing, along with lifestyle & diet changes, to provide the best care possible. When our 12 year old daughter was little, she was the most beautiful blue-eyed, blonde curly haired little girl, who we’d affectionately call our “blonde ditz”. She was cute and chubby and there was no malice in our words just affection. During family daycare years the carer would tell me “it’s like some days she’s here and some days shes not”, she would shy away from cuddles from extended family, seemed to lose complete days as if they never took place and took longer to use words then her siblings. There were lots of other signs as well, it was as if the light would go out of her eyes and she’d go and come back. We had her tested for petite mal seizures in kindergarten, she was diagnosed dyslexic at 6 by a specialist and border line intellectually disabled at the same age by a school psychologist (even though her intellect seemed average) and we thought we’d found the answer. We saw psychologists, OT, speech therapists, partook in dyslexia courses and a few other services – but still we felt lost. Bet this is familiar for a lot of parents? I started to change her nutritional intake, her social interactions, the environment in which we live and our lifestyle. She started doing equine therapy and loves horses, I started changing the way I served her food, the supplements she took and we worked on reducing sensory overload and anxiety triggers and slowly things changed. Of course she still has Autism and some days are worse then others, but she can manage her own sensory overload now and the meltdowns are rare. There is no one stop diet that will ‘cure’ Autism (they don’t need a cure anyway, it’s what makes them who they are!) or a pill that can ‘fix’. What there is, is a way to help reduce the sensory overload, improve social anxiety and interactions, improve cognitive and behavioural symptoms and help our children to live the life that they are meant to lead. I take an integrative holistic approach, by assessing all areas of the child’s health, lifestyle and environment to determine what may be the underlying causes and develop a treatment plan, to help the child flourish. For more information on how I use ‘Holistic Nutritional Medicine’ to help children with Spectrum Disorders and ADHD/ADD, please download my free guide under the Resources , located under the Consultations. I’ve always had a love/hate relationship with food. As a teenager I used food (or restriction of food) as a means to make me feel in control, when I felt totally out of control – after all I had something I could control – what I put in my mouth. Even as a young wife, if I felt out of sync with my new husband I would use this technique for control – my husband helped me immensely with this, without even knowing it, by simply being their for me, loving me for who I was and helping me to learn who I was. I learnt to fall in love with food and stop using it for control. I also suffered the common digestive symptoms of bloating, flatulence, cramps, diarrhoea, constipation, menstrual problems (yes they can be related!) and so much more, on and off over the years – i thought this was “normal”. But I was wrong – this does not have to be your normal! Fast forward a few years to the September of 2012, about 18 months after my last bub. I was under severe emotional stress with the passing of my much loved pop and my mum needing surgery to save her life, so I put my being so unwell & all my symptoms down to my anxiety and stress levels being at an all time high. This photo above was my every day, my normal – I felt bloated, sore, stretched, I had constant digestive issues (pains, cramps, nausea, bowel irregularities, flatulence and more!). My gut was unpredictable and I didn’t want to eat, or go out for fear of what might happen. It caused anxiety, stress and fear on a daily basis, I felt sick and was sick all the time (constant nausea, sinus, colds and any bugs going around!). Then came a diagnosis of gallbladder issues, which would be fixed with removal! WRONG!!! I got worse, it triggered food intolerances and a diagnosis of IBS – I got down to being able to eat a handful of foods and was loosing weight rapidly. I looked sick! I was scared to leave the house some days and my anxiety grew. After a long journey to heal my gut and a long road, with many hurdles along the way, these events are a rare occasion – I made it and so can you! I can now eat most foods again, my gut has healed, my immune system very healthy and my mental health so much stronger (anxiety is a rare occurance now too!). And I’m totally ok with not eating some foods, as I never look at what I can’t have, but all the beautiful foods I can have! Gut health plays a role in every facet of health, after all about 70% of our immune system lies in our gut! There has also been established links between leaky gut/poor gut health and brain function. The Gut-Brain-Immune axis, when dysregulated can leave our bodies prone to disease, illness, autoimmune disease and mental health conditions. I share my story, so you can know I truly understand the physical & emotional pain associated with food intolerances & allergies. If you also suffer from food intolerances (or suspect you may) & digestive symptoms or my story sounds familiar, I can help. THIS DOES NOT NEED TO BE YOUR NORMAL! Book a consultation today and start your journey to flourishing health!